History of pig domestication started around 10,000 years ago in central Asia. However it is very difficult to find out exactly when and how they were domesticated, because the fossil of wild bores and that of pigs resemble each other closely. Today pigs are raised in many countries especially in China and U.S. As the consumption of pig meat increases, the methods of pig farming also progresses. Pigs are susceptible to heat stress because they can’t sweat to cool themselves down. The skins are also very sensitive and easy to get sunburn. Therefore pig farmers who raising pigs indoors must have sufficient ventilation system. Even if they keep pigs outdoors, they still prepare some shelters for pigs to escape from sun light and heat. Pigs naturally wallow in mud to control their body temperature. The behaviour of rooting up ground boosts their immune system as well. Since pigs are curious animal, it is ideal environment for pigs to have materials such as straw, hay, wood, and sawdust to investigate. As omnivores pigs eat variety of foods such as grasses, roots, seeds and meats. The activity of finding food provides stimulation and stress free environment to pigs. Contrary pigs get only grains in intensive pig farming. It is very efficient way for farmers to control feed and maintenance of the facility. However intensive pig farming increases stress of pigs because there is no enough space for pigs to lay them down and mud to wallow. 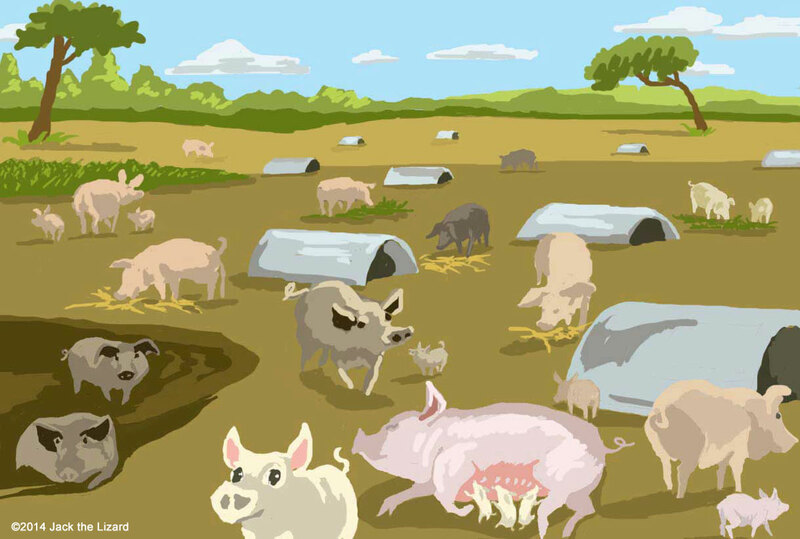 Automatic feeding system allocates vitamins and antibiotics to pigs, whereas epidemic diseases spread rapidly through the system as well. Outdoor pig farming has also set back. Pigs tend to get parasites such as lice or mites and internal worms. Managing excrement, especially smell, is also difficult. The quantity of meat is varied too. Eventually farmers must have skills and knowledge to solve those problems. Now European Union forwards animal welfare act and try to upgrade standards to improve lives of domestic animals. After all health of pigs is matter of health of humans.